Our intimate ballroom was originally built in 1923 to house the First National Bank of Mercedes. The Lobby has been remodeled to an extravagant dance floor with dressed tables and French gold chiavari chairs to accommodate any event. 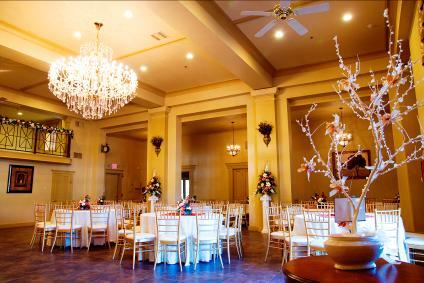 In the center you will find a breathtaking 7 ft. Swarovski Crystal chandelier that is sure to make any event spectacular. Our amenities include a Bride’s Room furnished with an elegant chaise lounge chair for the distinguished bride, a Pub Room featuring an Italian ornate fireplace and granite-topped pub tables, a Chic 1920’s Waiting Room designed for the honoree waiting to be presented down the stairs, a Stage Room supplied with ample power outlets for the musicians and a tranquil Courtyard surrounded by lush tropical landscape with the ability to accommodate elegant outdoor parties and ceremonies.